A domain name simply accesses the IP Address.. i.e The Domain Name of Facebook is www.facebook.com. The web hosting hosts pages of your website, & post them to visitor’s browser from their servers. Let’s get be to the point, You need hosting & a Domain Name. As you can see they’re offering a FREE Domain. Now Click on Get Started Now. Now Choose Your Plan.. *If you are a newbie I suggest the ‘Starter Plan’. Next you’ll choose a domain name for your Hosting Account, If you already own a domain name, you can enter it there. If you need a new free domain name then enter the domain name on ‘New Domain’ field. After entering your domain name, you’ll fill in your personal information. Then, you’ll choose which hosting package you want. Normal, shared hosting is priced at 12, 24 and 36-month terms. To help save you money, the longer term you purchase, the lower the monthly rate will be. You’ll then be asked to create a password for your account. Now, that you are all signed up and are able to log into your account. After filling out your information and have chosen your hosting package, click the “Submit” button to complete your purchase. We’ve got Domain & Hosting, Yay!. WordPress is a Content Management System aka CMS. We’re going to install WordPress on our website. 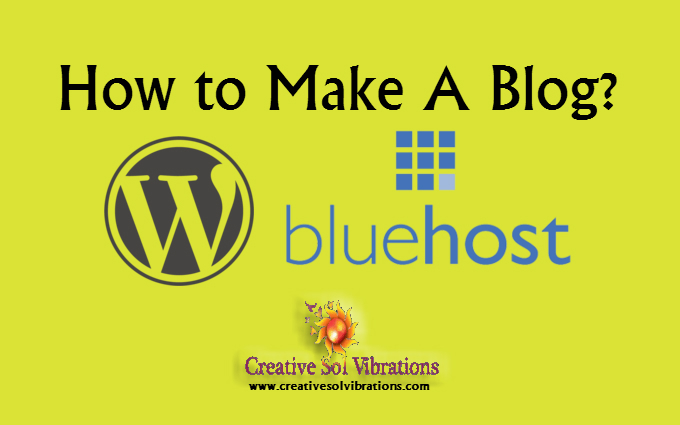 Login to your Bluehost account and Click on hosting at the top & get inside cPanel. In your cPanel, scroll to the section titled “MOJO Marketplace” and choose the “One-Click Installs” button. This will take you to a page inside MOJO Marketplace called Scripts and Platforms. The blog section is at the very top, so all you have to do here is click on the WordPress icon. Then, you’ll see this page, This Page explains about WordPess, and Click on the “Start” Button, that will start the WordPress installation. Now you can log into your WordPress site by going to the admin login URL yourdomain.com/wp-admin. Enter your username and password, then click “Log In.” This will take you to your WordPress dashboard. From here, you can control everything to do with your WordPress site, such as creating pages, writing posts, and changing the appearance. President of SolVibrations. Contact me for anything regarding our site.